Description Oh no!! 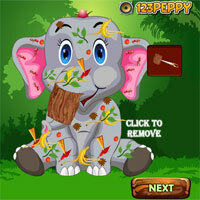 The cute elephant is injured badly while pulling down a branch. He needs your help to remove the leaves, insects, etc.,. Help him to recover from the accident. At last, dress up him with the best outfit and accessories. Have fun! !